I've said it before: Halloween is my favorite holiday. Nothing beats a fun costume and a stomach bowl full of orange Kit-Kats. I have been DIYing my own costumes since high school, sometimes from scratch, but mostly by modifying and/or putting them together using regular clothes I already own. It's really easy to pull things from your closet that will work for a cute costume--all you need is a little inspiration and the right accessories. I typically go with a recognizable fictional character (i.e. Alice in Wonderland, Dorothy, etc.) because it's classic and others seem to enjoy it. Plus, it's easy to put my own twist on it by changing up the accessories and using my personal style as a template. Here are a few past DIY costumes I've done using things I already owned, with some tips and tricks! Not quite Little Red Riding Hood, but definitely an allusion to the children's tale. I had a wolf Spirithood (an animal scarf/hat combo made out of faux fur) that I was able to build my costume around. Animal themed accessories are easy to find, even year round (cat ear and panda beanies! ), so take advantage if you already have some because it takes little effort to turn them into a costume. You can wear them with just about anything and no one will question what you are (well, usually). I'm a mouse. Duh. These are all actually everyday pieces from my closet--it really just comes down to the styling. Combined, they become Mary Poppins! 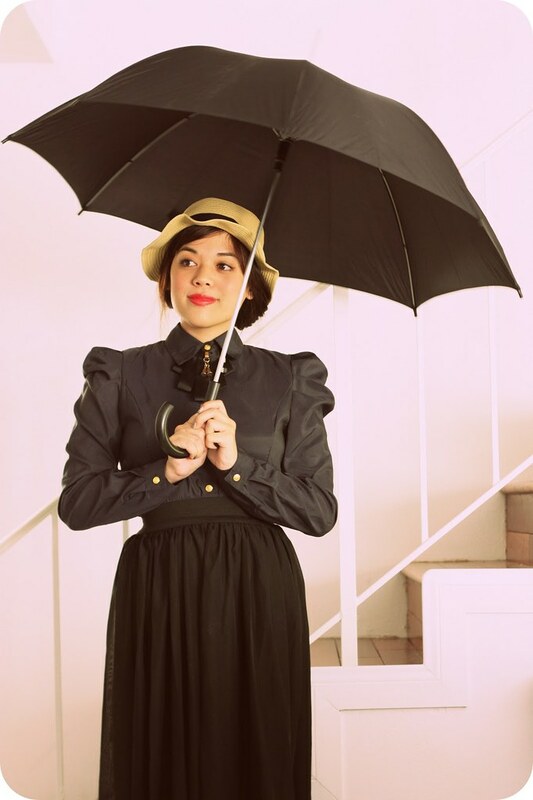 I wore a puff sleeve blouse tucked into a maxi skirt, and added an umbrella and boater hat. If I'd had time, I would've added fake flowers around the hat and carried a large satchel too, like she had in the movie. When playing a book, movie, or TV character, the littlest details can really help pull the look together. Minnie Mouse is probably one of the easiest because you can wear anything with polka-dots, throw on a pair of mouse ears, and instantly become recognizable as the character. This was a last minute costume of mine. I remembered I had the ears (old, from Disneyland) and a puffy polka-dot cocktail dress so I threw them on and fished out one of my bow belts and colorful flats for contrast. You just might have a random souvenir hat/head accessory from childhood that you can wear today too. This wasn't for Halloween, but for a themed night at a club . I didn't have a flapper dress, but I did have a beaded tunic that was definitely inspired by the 1920's. I wore it with a strand of faux pearls (borrowed from Mom), t-strap heels, tights, and a cloche hat--all of which I already had. Sometimes you may not realize it, but a lot of the clothes you buy may already reference the past in some way. If you're looking to dress as a historical character, research the period and take note if you have anything similar. One of my favorites to date. 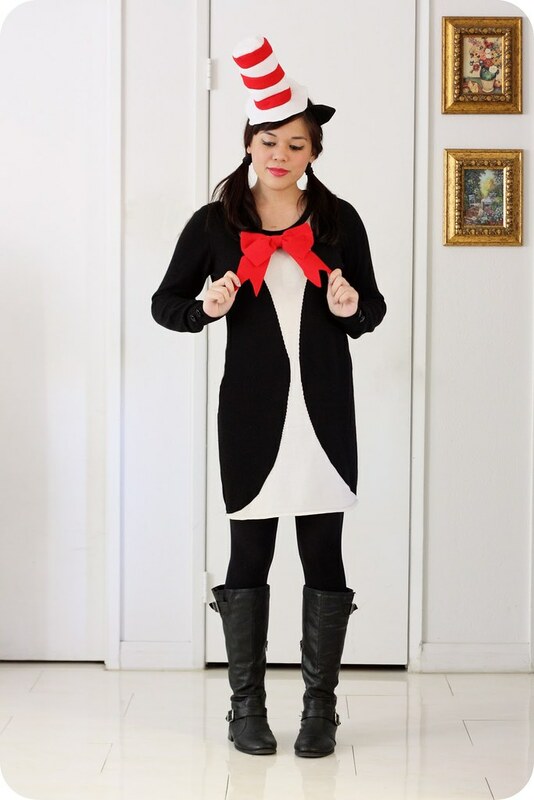 I decided I wanted to be The Cat in the Hat one Halloween and had the perfect tuxedo sweater dress to wear. All I needed was the iconic striped hat, so I looked up a few DIY tutorials online and made a smaller version, glued it to a headband, and attached a cat ear (I like my hair accessories to be off-center). Then I made a giant red bow pin to top it off. This required the most work out of all the costumes in the list, but I didn't like the options in the store and wanted the accessories to be a certain way. 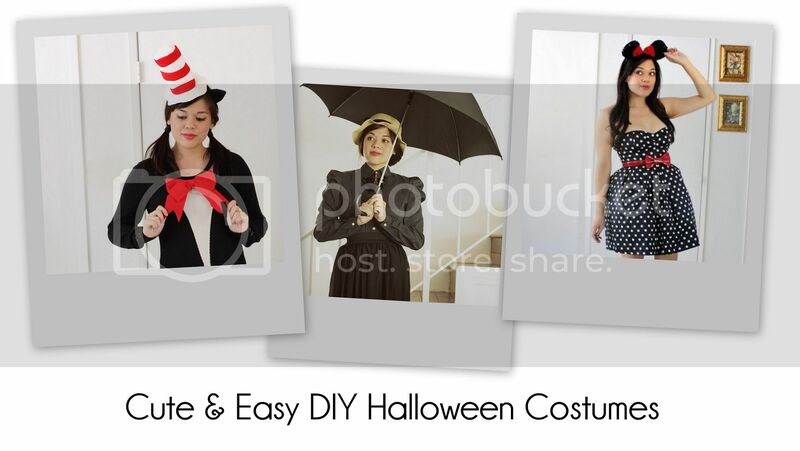 If you see something in the store that you need for your costume, see if you can find an online tutorial. You might be able to make something better and your costume will be one-of-a-kind!